He just wants to sit in the sun with his dad. Bulls really don't want to fight. Despite how they are typically cast, these animals are really sweet-natured, when they aren't prodded and terrified into a furious frenzy. 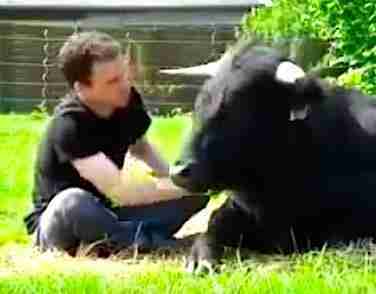 One man set out to show this - by adopting a bull as a pet. To dispel misconceptions about the natures of these animals, Christophe Thomas, of Rennes, France, bought a bull at an auction that likely would have sent him to a fight in Spain. The relationship between Thomas and his pet shows just what a softie the bull, named Fodjen, really is. And it shows how animals can also bring out the sweetness in man, another sometimes fierce animal. To help stop bullfighting, you can sign a petition here. You can watch a video of their amazing friendship below.